It was Sunday, October 30th, my birthday, and there we were, carefully moving from one tree to the next as we kept a watchful eye on the roughly six-foot-tall eyes staring us down. Not just two eyes though, more like 12. And to make matters worse they weren’t even all on the same side of the trail. About 10 were on our right, but just when I thought we stood a chance of getting by them we spotted two more on our left. Stuck we were, somewhere in the middle, praying they wouldn’t charge. The eyes belonged to a group of moose, and moose can be very unnerving creatures. They are big, powerful, and capable of running over just about anything that gets in their way. Never mind the bears and mountain lions, moose are probably one of the most dangerous animals in Colorado. And so it was, about 28 miles deep into our run with our emergency headlamp on and about four miles to go, that we were the unfortunate monkeys caught in the middle. Fast forward a week and I find myself back in those same mountains with a fading sun, a howling wind, and a snow-covered trail. It was a bit unnerving. Though the mountains were the same, the trail itself was different. Sure, I was familiar with the lower section, but this top bit, where the icy wind froze my glove-less hands, this part was new. Picking my way across the snowy terrain, my watch hit 12 minutes, signifying the end of my rest period and the start of the next hard interval. Okay, technically it hit one hour and 12 minutes, but my old-school Casio watch, which magnificently lacks all bells and whistles, doesn’t even time past 60 minutes. Instead it turns back to zero after each hour. Some might view this as a negative thing. I find it to be a nice reminder that training data is to be taken with a grain of salt. Sure, it can be good to run fast times, to have this week’s numbers better last week’s, but it’s not the be all and end all. What matters is that you put forth a good effort and push yourself. Stress. Rest. Repeat. That’s what it’s all about. Back to the matter at hand, though. As I surged ahead into my next hard interval, I gazed at the Continental Divide above me and stared at the icy lake below. Maybe I can make it to the top of the divide before my interval ends, I thought. I drove my legs, pumped my arms, gasped for air, and before I knew it, I was atop the divide with about two minutes to spare. I made a quick decision to turn left and surged across the ridge until my watch hit 19, or 79 minutes if you’ve been paying attention. As I continued on I was treated to a magnificent view of snow-capped peaks and a sinking sun. It was beautiful and unnerving all at the same time. The unnerving part is what I wish to focus on. Though beautiful, a setting sun meant an impending darkness. Sure, I had a headlamp with me, but there is something about navigating new terrain in fading light that can be a bit nerve-wracking. Would the wind freeze my hands again? How quickly would I be able to descend the icy terrain? Could I avoid losing the trail? Would there be moose in the dark? The trail itself hadn’t really changed since I came up it a short while earlier. Yet flipping it around and turning off the lights changed the dynamic enough to make me a bit uneasy. I think the uneasiness comes from an element of mystery. It reminds me of one of my favorite movies, Finding Forrester. In this movie there is a very intriguing exchange between renowned author William Forrester and his young protégé from the Bronx, Jamal Wallace. Forrester asks Wallace if he knows what people are most afraid of. Wallace doesn’t know the answer. Forrester goes on to explain that people are most afraid of that which they do not understand. “When we don’t understand, we turn to our assumptions,” he says. It makes sense. Running down the mountain, it seemed as if the darkness had messed with my understanding. I generally knew where the trail went, but the darkness gave it a different feel. It hid things and set my imagination on fire. Worries and doubts crept in as assumptions threatened to take hold of what my mind failed to understand. In the end I made it out just fine. The darkness didn’t really hold anything that wasn’t there in the light. Except, of course, for a muddled understanding, but that muddled understanding made all the difference. Looking a bit deeper, I can’t help but think about how this applies to life outside of running. Just like the dark trail, there are many moments in life when our vision is obstructed and our understanding wanes. Whether it’s the death of a loved one, an unexpected tragedy, or a moment in life that just seems unfair, we all experience things that are difficult to understand. The trick isn’t to avoid these things. They are going to happen. It’s part of life. What we can do, however, is find a way to combat the assumptions, to keep them at bay, and manage the fear they invoke. The next time you stumble upon a moose in the dark, look for a tree of understanding to put between you and the charging bull, side step the assumptions, and get right back on your way. After all, life isn’t meant to be lived in a pool of worry. Take the bull (moose) by the horns! When an unknown presents itself in front of you, how do you typically react? What have you learned from setting aside fear and diving into something you don’t entirely understand? Do you have an example from running? How about from life? Zach Miller is a mountain runner and full time caretaker at Barr Camp in Colorado. As caretaker, he lives year round in an off-the-grid cabin halfway up Pikes Peak. 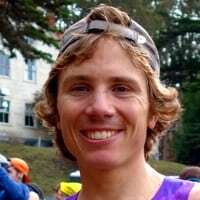 He competes for The North Face and Team Colorado. Additional sponsors/supporters include Clean-N-Jerky, GU Energy Labs, and Nathan Sports. Follow him on Instagram. This was 1978, when you actually had to go out and hunt down knowledge you lacked. There was no Google to the rescue. Eventually I did build a patio and a shed floor. The principle still applies, right? That’s the beauty of the outdoors–it always brings some degree of unpredictability: weather, terrain, wildlife. And you don’t have to go out to the wilds of Colorado to face it. An early morning walk with your dogs on a neighborhood trail might bring you face to face with an even worse menace than a 1500 lb. swamp donkey: a skunk will call upon your inner MacGyver like nothing else!